Gippsland Lakes fringing vegetation has and still is being threatened by a number of factors, including introduced species of herbivores, particularly pigs and Hog Deer. “Although ecological studies are limited, severe damage caused by Hog Deer has been confirmed in natural rainforest and on rainforest restoration sites. Browsing and antler-rubbing has been responsible for killing young saplings of preferred species such as Black Wattle, varnish Wattle, Blackwood, Kangaroo Apple and Yellowwood, preventing their regeneration and, in some areas, resulting in the alteration of plant community composition and structure” (Bilney & Bilney 2008). In a post fire survey in 2010 Acacia terminalis (Sunshine Wattle) and Banksia serrate/integrifolia (Saw Banksia/Coastal Banksia) seedlings were recorded and three study sites were established to monitor their growth and survival. Acacia terminalis is a fast growing, open spreading shrub of 2-3 meters in height, but is reported to be short lived due to attack by borers (ANPSA 2010). It was also noted that Acacia terminalis does not respond well to hard pruning (Wildseed Tasmania 2010) which could occur from severe impacts of browsing. The purpose of this study is to monitor the survival and growth rate of Acacia terminalis and Banksia serrate/integrifolia seedlings after a prescribed burn in 2010 on an area of Boole Poole Peninsula managed by Parks Victoria. At each of the three sites a 5 meter x 5 meter plot was established. A permanent corner peg with a metal tag referenced B1, B2 or B3 gave the starting point. A GPS reading was recorded for each starting point and each plot followed site specific compass bearings (refer below). All Acacia and Banksia seedlings found within each plot were recorded as was maximum height. Surveys were undertaken on the 14th November 2011, the 7th November 2012 and the 11th November 2013. Photos were taken at each site as was a general species list. In 2011 three tree guards were placed around Acacia and Banksia seedlings at site B1 to be used as reference points. In October 2013 10 extra tree guards were erected at each site (See attached Tree Guard Data Sheet). No Acacia mearnsii mature or seedlings have been recorded at any of the 3 sites although this species was known to naturally occur on Boole Poole. On the 11th of November 2013 10 Acacia mearnsii seedlings were planted and guarded for future seed generation (4 @ B1, 4 @ B2 and 2 @ B3). This seedlings are separate to this survey. Plot B1: GPS: 55 0577802 -5805464. Compass bearing from starting peg: 300o, 210o, 120o, 30o. Plot B2: GPS: 55 0578463 -5803773. Compass bearing from starting peg: 60o, 330o, 240o, 150o. Plot B3: GPS: 55 0577682 -5803631. Compass bearing from starting peg: 180o, 270o, 360o, 90o. At all sites a full species list was compiled by James turner. 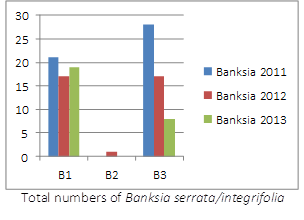 In 2011 site B1 recoded a total of 21 Banksia integrifolia/serrata and 7 Acacia terminalis seedlings. The Banksia seedlings were up to 200mm tall and the Acacias up to 100mm tall. All showed signs of some browsing. In 2012 site B1 recorded 17 Banksia integrifolia/serrata and 10 Acacia terminalis seedlings. The Banksia seedlings were up to 140mm tall and the Acacias up to 100mm tall. All showed signs of some browsing. In 2013 site B1 recorded 19 Banksia integrifolia/serrata and 4 Acacia terminalis seedlings. The Banksia seedlings were up to 140mm tall and the Acacias up to 150mm tall. All Banksia seedlings showed signs of some browsing. There were 2 new Acacia seedlings with no sign of browsing and all were showing sign of fresh growth. It was noted that most of the seedlings that have survived were receiving protection from the bracken. Overall for site B1 there was an increase of 2more Banksia integrifolia/serrata seedlings (11% gains from 2012) and a decrease of 6 Acacia terminalis seedlings (60% decrease from 2012). Banksia integrifolia/serrata maximum height remained the same as 2012 and Acacia terminalis seedlings recorded a 33% increase. In 2011 site B2 recoded a total of 0 Banksia integrifolia/serrata and 19 Acacia terminalis seedlings. The Acacia seedlings were up to 150mm tall. All showed signs of some browsing. In 2012 site B2 recoded a total of 1 Banksia integrifolia/serrata and 17 Acacia terminalis seedlings. The Banksia seedling was 10mm and the Acacia seedlings were up to 340mm tall (average 100mm). All showed signs of some browsing. In 2013 site B2 no Banksia integrifolia/serrata seedlings were recorded (although one was noted just outside of the survey area) and a total of 8 Acacia terminalis seedlings. The Acacia seedlings were up to 140mm tall. All showed sign of good new growth and indication of older browsing. Most seedlings had protection from bracken and a fallen tea-tree. Overall for site B2 no Banksia integrifolia/serrata seedlings were recorded and a decrease of 9 Acacia terminalis seedlings (53% decrease). 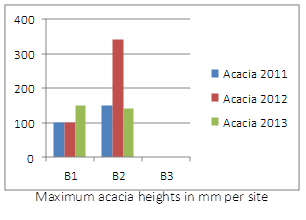 Acacia terminalis seedlings recorded a maximum height of 140mm (59% decrease compared to 2012). In 2011 site B3 recoded a total of 28 Banksia integrifolia/serrata and 0 Acacia terminalis seedlings. The Banksia seedlings were up to 250mm tall. All showed signs of some browsing. In 2012 site B3 recoded a total of 17 Banksia integrifolia/serrata and 0 Acacia terminalis seedlings. The Banksia seedlings were up to 300mm tall. All showed signs of some browsing. In 2013 site B3 recoded a total of 8 Banksia integrifolia/serrata and 0 Acacia terminalis seedlings. 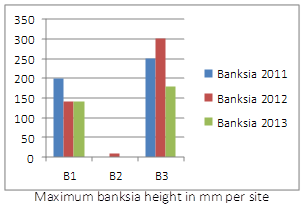 There were 2 new seedlings of Banksia and the maximum height of all recorded was 180mm. All showed signs of some browsing. Overall for site B3 there were 9 less Banksia integrifolia/serrata seedlings recorded (53% decrease) as with 2012. Banksia integrifolia/serrata maximum height decreased by 120mm (40% decrease). The reference Acacia terminalis from 2011 protected by the tree guard recorded a height of 1100mm (14% increase) but it had reached the top of the guard and all growth beyond that had been browsed off. All three sites showed effects of grazing on seedling development and there was evidence of some new recruitment since 2012 which may be a result of favourable weather conditions. Although the results showed increases and decreases in total numbers of seedlings across the study sites, there are many variables that were not measured that could account for this including competition, extreme weather conditions and insect attack, but the impacts of browsing noted over the study period must have an impact. The more important finding is that on the seedling growth rate over the one year period. 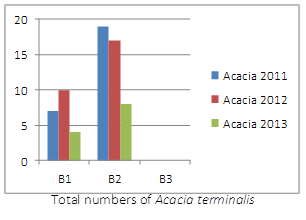 Although there were slight increase between 2011 and 2012, 2013 recorded a decrease in most sites for both species highlighted by Acacia’s at site B2 and Banksia’s at B3 recording maximum heights below those recorded in 2011. The reference acacia at site B1 recorded a 14% increase (1100mm) in height from 2012 and this would have been more if the guarding had been higher. From this we can draw a conclusion that browsing is having a direct effect on seedling development, unfortunately though we still have no evidence of what is causing the browsing but hopefully with the installation of remote cameras at each site conclusions may be drawn. On the overall species list, James Turner noted that in 2013 there were considerably more seedlings present at all sites this year covering a range of species, plus a few additional new species. James expects this just reflects the wetter seasons. Fruiting material was collected from a little sedge that keyed out to Luzula meridionalis . James suspect this species may in most cases in the past be what he had identified as Juncus planifolius. Red baring on the outside of labellum. I feel that no more information can be gained from continuing the plot survey. The findings show that although each year new seedlings occur overall the total number is decreasing since 2011 post fire. This is the same with both species maximum height as noted in the findings and conclusion. Remote camera monitoring needs to continue to determine the herbivore specie/s responsible for the browsing. It could be valuable to monitor the growth and survival rates of the reference Banksia’s and Acacia’s for another 2 years to compare with the findings from the plot surveys to show the impacts of browsing.